Calling all mermaids! This is not a drill, I repeat - this is not a drill. Under the Sea, the first ever mermaid-themed cafe in the Philippines has opened its doors to all mermaids, regardless of age, gender or tail-fin! 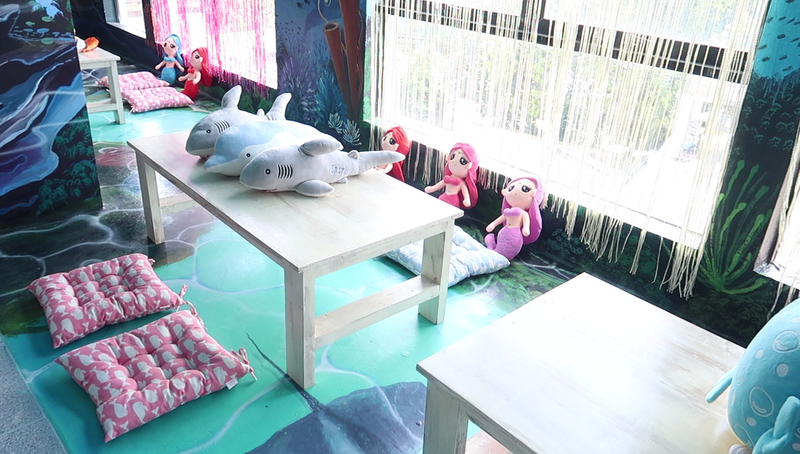 Under the Sea is an underwater-themed cafe which showcases all things mermaid. Upon entering, you will be greeted by a huge clam which is the most perfect spot to take your Instagram photo! The whole area is well-lit by natural lighting but still gives an Aquamarine vibe due to the beautiful murals that surrounds the whole restaurant. Customers can either dine on the tables or be comfy on the floor. Friendly sea creatures and pretty mermaid stuffed toys also are scattered amongst the ocean floor! Everyone is encouraged to hug at least one! Alsooooo, it wouldn't be a mermaid cafe if there aren't any mermaids! And yes, you can be a mermaid too! You just have to purchase at least PHP 150 from the menu and you can be a real-life mermaid. Mermaid costumes (mermaid bra, headdress, and tail) are available for use for kids and adults. In a span of two weeks, I visited Under the Sea twice (please don't judge me HAHA). During my first visit, the restaurant was quite empty since it was on a Friday afternoon. Service was amazingly fast and the crew were accommodating. During my second visit, the place was full and jam-packed since that was on a Saturday afternoon. To my surprise, the service was just as fast as my first visit. The food came in one by one and not at the same time, which is fine by me. I was seriously impressed on how they presented the food. The attention to every little detail had me shookt! From the plating to the actual shape, they got it all mermaid-ized! Even the actual plates and containers they used are very innovative. As for the food choices, I really liked that they offer everything from appetizers to desserts. A lot of seafood was actually offered (mostly fish). However, I can say that the cuisine was not specific to Filipino food since there was pasta and Cajun fish fillet. My favorite was the Chicken Alfredo and Mermaid Milkshake. As for the prices, I highly applaud how budget-friendly every item is. Considering the presentation, serving, and effort done to prepare one order, everything was worth it. I mean - have you seen the sand bucket cheesecake??? Have you been to any magical cafes lately? Ang cute ninyo! The foods really looked like na parang nasa Under the Sea talaga, nauto ako sa Sandbucket churva. :D hoping to visit this soon! Thanks, Kai! I've been really excited about their opening and now I am so glad they've opened!! Gusto ko ulit bumalik! Haha. Ang saya niyo kasama <3 next time ulit, please! Full outfit na tayo, para feel na feel natin. I'd like to have one of those mermaid stuff toys. so cute. Kainggit na you girls all met up na! Hahaha! I wanna try this cafe too when I end up in North. Katabi rin nito yung isang themed cafe, diba?